CH. Jewels Pardon Me Boys "SugarBaby"
AKC Breeder of Merit. 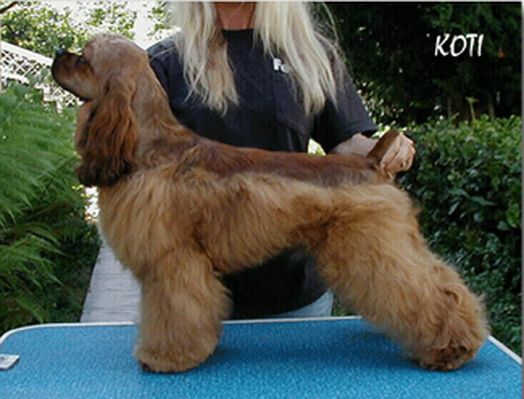 I have been a hobby breeder of American Cocker Spaniels for over 24 years of 7 generations out of my breedings of show quality puppies, with excellent references. 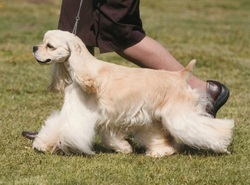 Providing loving Cocker Spaniels to loving pet or show homes. Family raised champion Cockers that vary in colors and sizes. My breeding program is for the AKC standards, quality, health, intelligence, the sweet mellow temperaments that my lines carry, and to help better the breed. Health testing such as OFA and annual eye certifications is done on all my breeding stock. To me this is a passionate hobby, not a business or used as a commodity. My devotion and love of the breed has come through many years of ownership, and experience with the breed. Some of my homebred puppies have excelled in the show ring, agility, obedience, and as certified therapy dogs as well as just beautiful, sweet loyal companions. I am located in Northern California (Sacramento area). I hope you enjoy the pictures of some of my puppies and dogs throughout the years posted on my website. I have puppies available from time to time please feel free to contact me at (916)-645-1466 or email: jewelsckrs@yahoo.com. If I do not have what you are looking for, I might be able to help you, as I may know another breeder that might have what you are interested in and refer you to them. In Loving Memory " LadyBug ", "LadyBug Nelson II "
In Loving Memory "Ebony" , Jewels Lakotah Mischief Maker , (CH. Hi-Acre Dance Of The Lakotahs X Emily Wrapped In Sable Lace). Owned, loved & miss very much by Nanci Mickelson. In Loving Memory " Callie" (Kookie's Amazing MacKenzie X Emily Wrapped In Sable Lace), owned, loved & miss very much by Mita Krstevic. In Loving Memory "Koti" Jewels SBL Lakotah Controversy (CH. Hi-Acre Dance Of The Lakotahs X Emily Wrapped In Sable Lace). Owned & Loved by Judi Frant.